Chances are you have heard about identity theft, online spying, exploited personal information, stolen credit card details in the recent past. You may be wondering who’s watching what you do, where you go online, and what websites you visit? Now that almost everyone uses the internet across all age groups, the privacy of each and every one of us is at risk. Advertisers, service providers, and governments all around the world are seemingly more interested in tracking all our online activity. Not to worry. Here are some quick tips to help you protect your privacy online. Some or most of us want to skip inputting manually our login credentials(user-password) each and every time we go to our email provider, social media sites or other websites using our browsers. Thus, we tend to save our user and password on our browsers to automatically log on. However, convenient as it may be, that user-password is also at risk. It can be stolen or copied by anyone who can get an access to your browsers. To prevent anyone from catching your usernames and passwords, do not save your log-ins. However, if you have saved a list of them already, you can follow the guide below on how to remove them. Now, your Chrome browser is clean of user-password combinations. Close Chrome. Launch Edgefrom your Start menu, desktop, or taskbar. Now, you can be rest assured that your user-password logins are no longer at risk. A cookie is a packet of data which holds information that your computer receives and sends back without altering or changing it. These cookies are saved on your browser when you visit a website. Cookies are used in different ways, but, the common use of it is to track user’s visits and activities. How can you prevent yourself from being tracked? Protect your privacy by deleting cookies after using your browsers. Cookies are cleared. Exit Chrome. Click Privacy and Security. Under Browser Privacy, click on “clear your recent history”. Lunch Edge and click on the three-lined hub at the top right side. Click on the clocked-shaped history button. Make sure to check cookies and saved website data. Lastly, click on “Clear” button and exit Edge. Now that every traces has been removed, your online privacy is not at risk anymore. 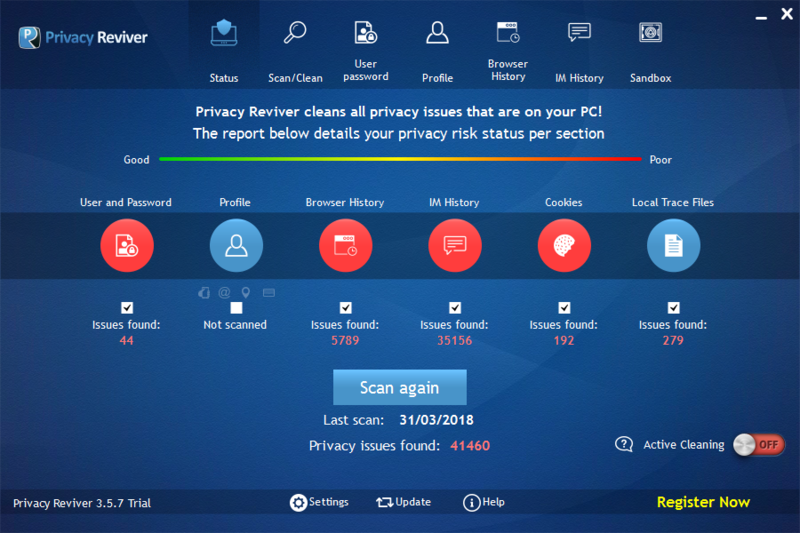 ReviverSoft’s Privacy Reviver is your one stop online privacy companion. It protects your privacy in a single click, so you can spend more time on what really matters. What privacy features does it include? It has a deep scan for user and password combination for all of your installed browsers. It scans for a list of logged profiles and personal details. It scans and shows you a full list of browsing activities, including history and portals. It scans for all tracking cookies saved on your computer. It scans for all logged chat records from the main Instant Messaging platforms. It scans for all records that reveal your recent activities. It enables you to protect your privacy online by revealing items that are at risk of being exposed. You may then review or check the items found and decide what to delete what to remain. You can also use the convenient “Active Cleaning”technology to automatically clean all the selected items every time you close/exit your browser.